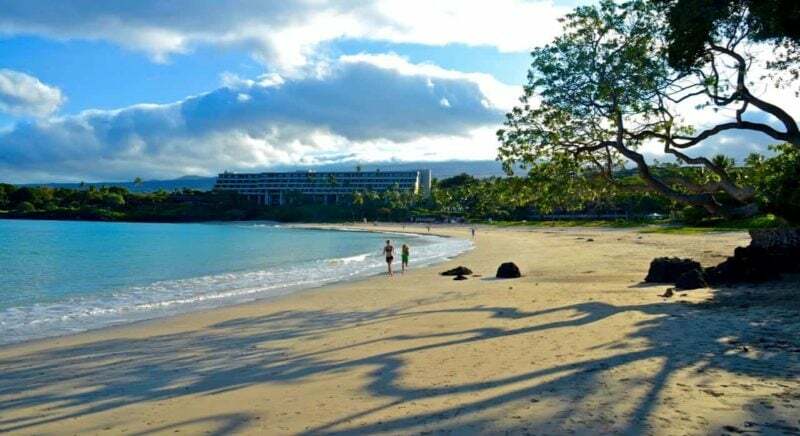 Kauna’oa Beach is also known as Mauna Kea Beach because it fronts the Mauna Kea Beach Hotel. This beach is one of the prettiest white sand beaches in Hawaii. Mauna Kea beach is a family beach with good access to facilities and is great for sunbathing, but also for activities that do not require high surf such as snorkeling. However, during the winter months, waves are normally higher and a pounding shore break and strong rip currents can make entering the ocean hazardous. The beach stretches for about half a mile and the waters are generally calm. There are also two small coral reefs on the sides of the beach. Kauna’oa beach is great for sunbathing with its white soft sand that slopes gently into the water and the palm trees along the fringe to provide shade. If you are into more adventurous activities, try snorkeling along the rocky, southern side of the beach. Sunrise at Mauna Kea beach. Photo credits: Mike neenan. If you get hungry or thirsty and didn’t pack good snacks for the beach you can walk over to the hotel restaurant right on the beach. They serve decent lunches and great tropical drinks here (think ice-cold piña colada), but keep in mind that the prices are high. You can also rent gear such as snorkel equipment and boogie boards from the beach concession by the restaurant. Kauna’oa Beach is a public beach, but to get to the beach you have to pass over the Mauna Kea hotel grounds. You can get a free pass and map from the security office at the entrance of the hotel. Kauna’oa Beach at night – Manta Rays! The Mauna Kea Beach Hotel turns on floodlights over the water after the sun goes down. These lights attract plankton, which in turn attract hungry (but harmless) manta rays. There is even a lookout called “Manta Ray Point” where you can get a good view (if you are lucky and the manta rays show up) of these mysterious evening visitors. Have a look at out information on the Manta Ray Night Dive if you are interested in finding out more on the manta rays. 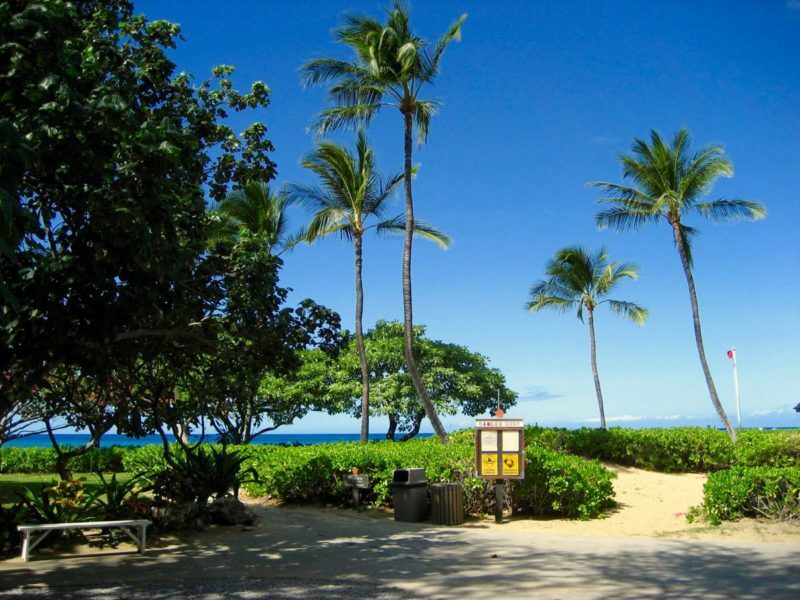 Kauna’oa Beach itself is – like all beaches on Hawaii – public access, but the parking lot belongs to the Mauna Kea beach Hotel. The hotel has parking space for visitors that are not staying in the hotel, but these are limited (40) and fill up quickly. If you want to go to Kauna’oa Beach, get there before 8:30 am to get one of the 40 public parking spaces. If you are feeling lucky you can stretch this to 10 am in low-season, but make sure to have a backup plan (see next paragraph). Don’t worry if the public parking spaces have filled up before you arrive. 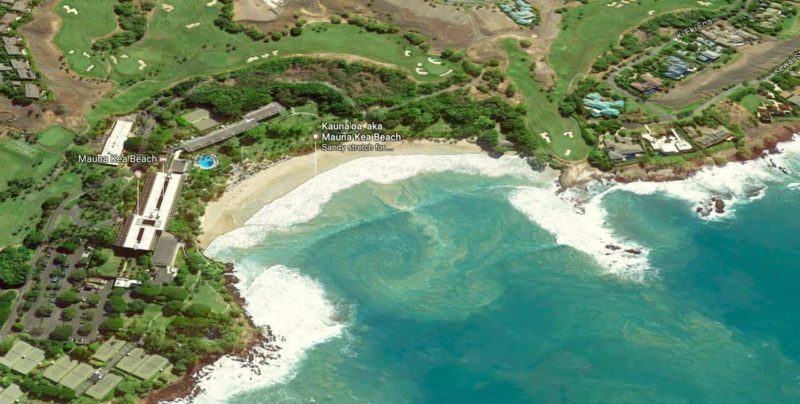 You can drive a short mile south to get to Hapuna Beach, the other perfect white sand beach on the Island of Hawai’i! The parking lot here is huge and never fills up but a parking fee of $5/car is charged. Take Highway 19 north from Kona and turn left at Mile Marker 68. Look for the walls with “Mauna Kea Resort” along the Highway – you can’t miss them!. Follow the road to the end of the road for public access and get there early to get one of the passes for the general public — they give you instructions on where to drive and park. Two other smaller beaches can be accessed by walking for about 1.5 miles (2.4 km) north of Kauna’oa – Waiulaula Beach and Mau’umae Beach. Both are two small pockets of white sand. Hapuna Beach state Park – [1 mile] One of the best beaches on the island for swimming! This 1/2 mile white sand beach is regularly voted among the ‘best beaches in the world’. Waialea Bay Beach – [2 miles] Secluded white sand beach. Some private property on the ocean front but also public access. If the surf is calm this is a good place for swimming and – on the north side – snorkeling! Somewhat crowded on weekends.